Want to lower your carbon footprint by bringing down your energy consumption and save on heating costs? Folks at YSHAPE Inc have kickstarted their campaign to realize the launch of an energy monitor that would allow you track your domestic energy usage. For doing so, the HeatMeter keeps a regular tab on your efficiency efforts, monitors your carbon footprint, sets your energy goals and accordingly, keeps you informed about your progress. Using HeatMeter, users may access their daily energy usage remotely via emails or text message alerts. The WiFi enabled contraption relies on attached sensors to send information regarding your heating system over the internet. 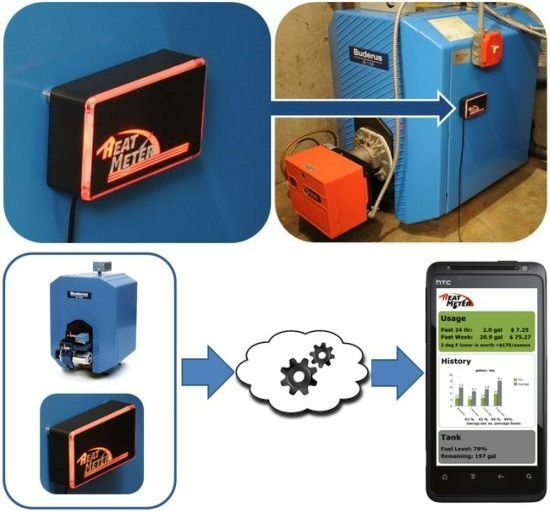 The HeatMeter stores your home’s square footage, zip code and heating system model in its database and sends this info to your smartphone or computer. According to YSHAPE, the HeatMeter is more accurate than smart thermostats. Moreover, the contraption is compatible with just any kind of home heating systems – be it a natural gas, propane or oil one.